it's here and then gone. Be blessed to awake to morning's new dawn. sneaking quietly by; we don't have a say. Another day, another hour, another minute devoured. like the steps of a coward. lock it away safe and sound. Don't waste away moments that cannot be refound. We can't see very far and aren't sure there's more. Move forward, with passion, share blessings and love. I have not updated recently because there isn't much happening. We are in waiting mode. My blood work results are not back from Maryland. The local KRAS clinical trial doesn't even have a trial number assigned by the FDA yet, and no other new trials have been found. I am not discouraged, but anxiously waiting to see what the Lord is going to provide in the long run. 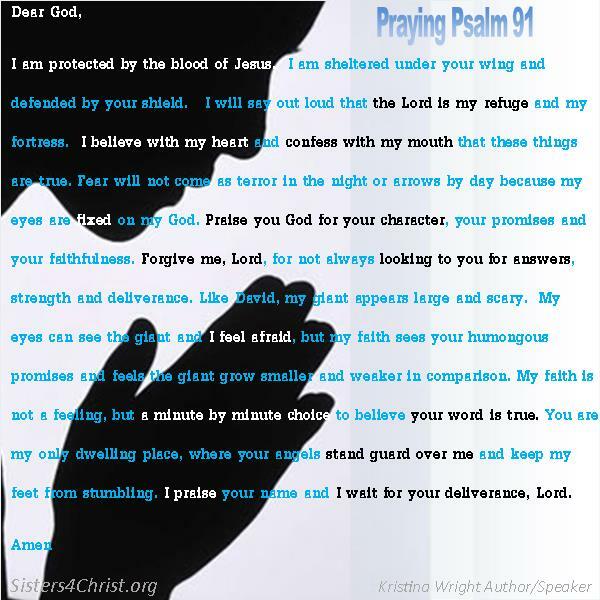 In the mean time I've been praying this prayer based on Psalm 91. May you pray this boldly for your own "giant" today! Well, my blood sample is on the way to Maryland to be tested for the clinical trial. This feels odd, sending blood through the mail, but important! We don't know if Immunotherapy is the answer. We don't know if a KRAS trial is the answer. But God knows. I trust he's in the minds of all the playmakers, mine included! Just when I need encouragement he sends it! Just when I need a glimpse of hope he sends it! God, increase our faith and make a way for us! When the river is high and raging part the waters! Please remember to join us asking God for healing. Asking God for a clinical trial that will work and advance cancer research. Ask God to intervene, to provide in every way. Ask For God's light to shine bigger and brighter so people cannot ignore the blinding ray upon their heart! God is bigger than cancer. God is better than research. God is best at healing!